Dubai has become one of the fastest-growing golfing destinations in the world and hosts world championships on both the US PGA Circuit and Asian Circuits. At Arabian Explorers, we can offer you the chance to test golfing talents across a wide variety of golf courses. Golf clubs across the UAE offer exceptionally high standards of service, dining and clubhouse facilities. We ensure that every aspect of your experience is perfect right down to the final tee, whether it is in the form of organized corporate tournaments, branded gifts for participants, tee-off schedules or the planning theme events on-site. 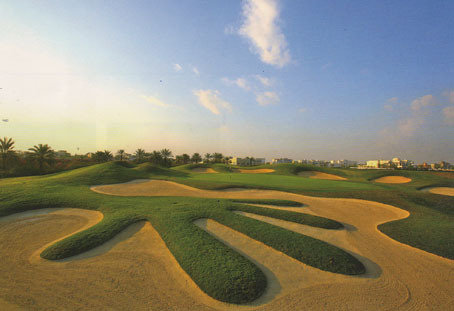 The Middle East’s first grass golf course, the retention of much of the original desert landscape and natural cont ours makes it unique. Choose to play the 18-hole Majlis or the 18-hole Wadi, both superb championship courses. This floodlit 18-hole course neighbours the venue for the Dubai World Cup, the world’s richest horse-race. Built around six lakes with treacherous, deep pot bunkers, the gently rolling landscape is deceptive, requiring accuracy rather than length. This nine-hole, Peter Harradine-designed golf course is both scenically stunning and an exciting challenge. Each hole is unique, with exotic trees and shrubs - wooden gazebos, panoramic views of the Gulf and peacocks roam the course. It is also playable as an 18-hole course, thanks to the four tee positions at each hole; the course features a large central saltwater lake that comes into play on five holes and well manicured, championship standard Bermuda grass greens and fairways. The Peter Harradine-designed course is all you would expect from a Troon-managed facility. An abundance of palms, ornamental trees and strategically placed bunkers and saltwater lakes is spread across 162 hectares. It features two world-class 18-hole golf courses, fully mature National Course (7,204 yards) and a more forgiving Garden Course (6,524 yards), with 9 floodlit holes. This 18-hole, 7,700 yards championship course is the region’s first and one of the 100 genuine desert golf courses worldwide. The desert contours provide one of the most testing courses for golfers, with championship tees and four tee boxes. It is also the first golf complex in the Middle East to feature Golf Plus, which uses satellite technology and GPS to calculate the distance between the buggy and the green. With 14 lakes and 72 bunkers, this 18-hole championship course is spread over 200 landscaped acres and boasts the largest single green in the world, in the shape of the UAE designed by Cohn Montgomerie. In this vibrant metropolis, experience a dynamic, one-of-a-kind destination, combining exceptional golf with dazzling restaurants and function spaces. The focal point is the breathtaking clubhouse, designed to capture the swirl of a golfer’s swing. Plan a visit to this unparalleled Four Seasons facility as one of the highlights of your Dubai stay. This mountain resort hotel, an hour drive from Dubai, has a floodlit mini-golf course of 18 holes and a 9-hole, 1,057 yard cross-country fun course. An 18-hole course as well as a golf academy, features a 9-hole course and practice facilities with floodlights. The course is 6,800 yards in length with four tees - professional, men, seniors and ladies. The only golf club in Sharjah, located at Intersection 5 on the Sharjah/Al Dhaid Road. This active club offers an 18-hole course, 9 of which are grassed, and incorporating a floodlit practice range.